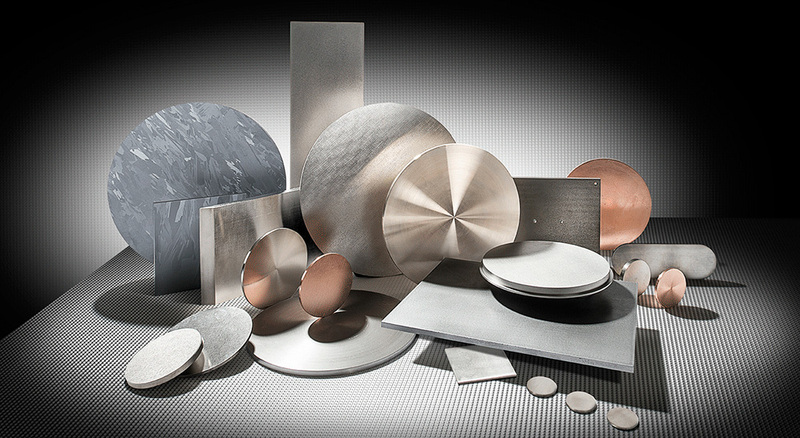 Testbourne metal sputtering targets have been accepted in a wide range of applications from ferromagnetic thin films, high index films in infrared filters, semiconducting films, capacitor dielectric films, photoconductive films, lubricant films, magnetic and memory elements to name but a few. Manufacturing processes we use depend on the properties of the target material and its application. Fabrication methods vary from vacuum melting and rolling, hot-pressed, special press-sintered process, vacuum hot-pressed and forged. Currently our standard round target sizes range from 1" to 20" in diameter, and the rectangular targets are available in lengths up to and over 2000mm in single or multiple piece construction depending on the metal. Our metal targets are offered in various purity levels to suit your specific requirements, with the minimum purity of 99.9% up to 99.99% for some metals like Aluminium, Copper, Molybdenum and ultra-high purities of 99.995%-99.9995+% for Aluminium, Tellurium, Titanium, Cadmium, Silicon and Molybdenum. Although purity levels higher than required increase material costs, in some instances, the use of too low a purity can result in poor film quality. If you have requirements to specific impurities, we may be able to control them within the target. In addition to standard configurations we welcome custom design target requests.